Hi, I'm Kathy Greaser a small breeder and Hagen Tropican food distributor. I like to keep the breeding small so I can give my birds the individual care that I feel they should have. 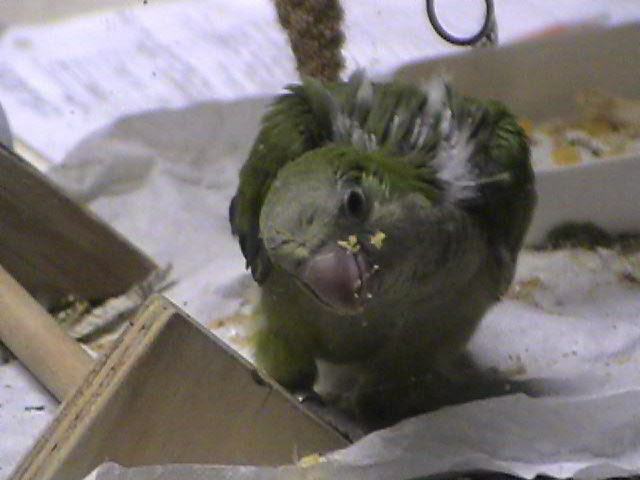 I've been breeding since late 1992 and I breed Cockatiels, Lovebirds, and Green and Blue Quakers. Below are some of their pictures. We have a pet lovebird, Jelly, and an umbrella cockatoo, Tori. 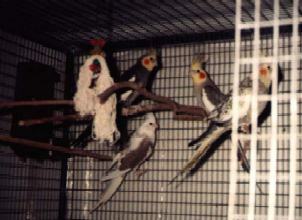 Our first pet, Hon, a male tiel is how I got into breeding. My daughter, Kelly, thought it would be so cute to watch Hon be a daddy. So I got into it for her, now she's grown and gone and I'm still breeding. The birds are the lights of my life and I enjoy it tremendously. 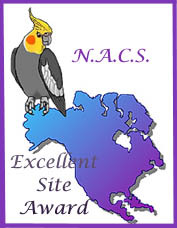 I belong to NACS(North American Cockatiel Society), ALBS (African Lovebird Society), PBAV (Pet Bird Association of Virginia)and my local club PCBS Pennisula Caged Bird Society). I'm a board member, the Lovebird Director, and the previous Cockatiel Director, for this club. 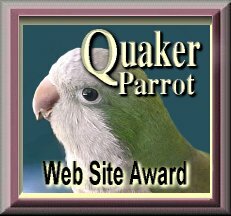 I also maintain the breeder list, do the "for sale" ads in the newsletter and maintain their web page along with the web page for BCA (Bird Clubs of America). 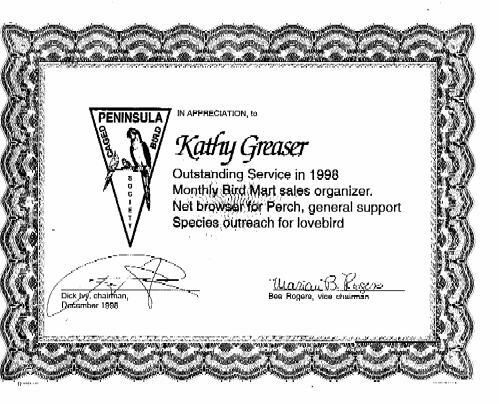 I'm was also on the Board of BCV (Bird Clubs of Virginia)for 4 years. rice mix ( pasta, brown rice & 15 bean soup mix) I also sprinkle Lactobacillus Acidophilus on this. 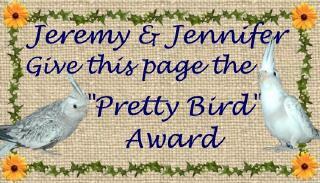 For information on how to feed breeder birds go to my breeder site. I've set that site up as a training course for new breeders. So if you'd like to breed please visit that site. The flight cages look empty right now because most of the birds are set up for breeding. I also had to take all the toys down to be able to take the picture of the birds. My husband built these cages for me styled after Corners stackable breeder cages. You can see more about the aviary itself here. As you can see I have many mutations and they are available all year. Six different pair of lovies, 3 pair of quakers and 2 pair of tiels are set up at all times so I usually have a variety. The little one in the tank is Tuesday, the first quaker baby I raised. 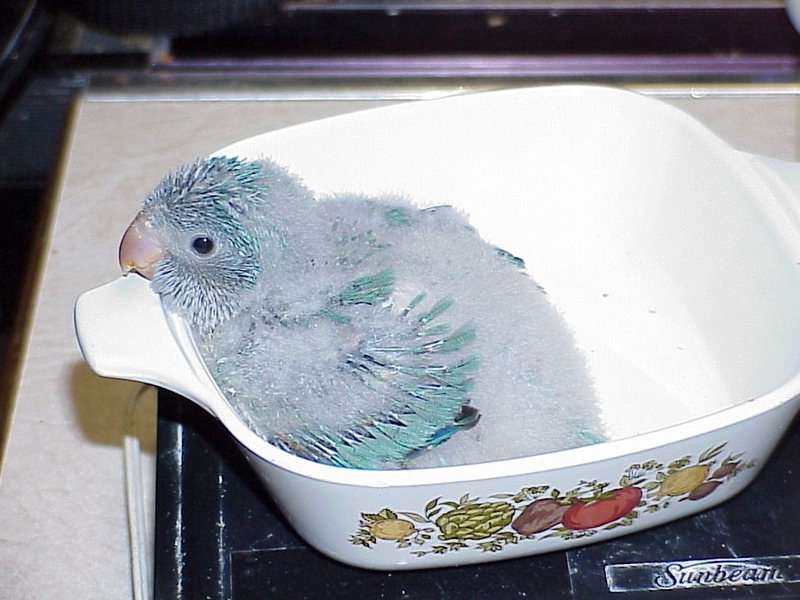 Here's a pic of my first Blue Quaker, Shamus. I just wish the quakers bred as easily as the other species. I pull my babies at 14-17 days for hand feeding. 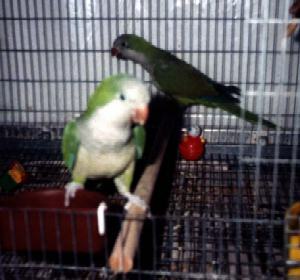 They are banded with African Lovebird Society, North American Cockatiel Society and L&M bands. They are well socialized every day. They get played with and cuddled daily so that when you get them they are so tame you can do anything with them. They are brought to the dinner table to be taught a few manners. From the time they are 3 weeks old they are offered all the foods mentioned above so they will eat anything that you offer them when they get to you. All babies are trained to drink from water bottles. No more poop soup! I do not ship. I don't feel it's worth the expense to ship one at a time. I also don't sell unweaned babies and all the reason why are here. Available Babies link with pictures provided below. Links mentioned above and many more! Hagen Tropican Products :About Hagen and it's Products. TROPICAN AND THE COMPETITION - WHAT'S THE DIFFERENCE? Cages: I've start carrying cages to sell with birds to save you a trip to the pet shop. 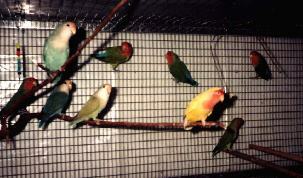 LoveBird Mailing List: Wonderful links to all kinds of Lovebird info. This list is one of the oldest ones on the net. Very friendly. My article on Pellets is here, plus many other very good ones. Pennisula Caged Bird Society: A bit about the club and how to join. Worth the membership fee just to get the "Perch". Crow's Nest: Paul Crow is an African Lovebird Society show judge. Has some beautiful pictures of the new mutation, Opaline, on his page. 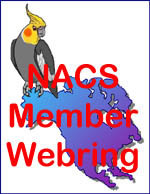 North American Cockatiel Society Members' Webring? is owned by Kathy Greaser.